Internationally acclaimed self-help author Marianne Williamson has announced her candidacy in the 2020 US presidential election. At an event held at The Saban Theatre in Los Angeles on Monday night, Williamson urged economic reforms in light of the „spiritual and moral rot“ that she claims has festered for decades. Williamson, a native of Houston, Texas, has penned faith-based bestsellers and spiritual self-help books. She is a regular on „The Oprah Winfrey Show“ and has been called Winfrey’s spiritual friend and counselor. 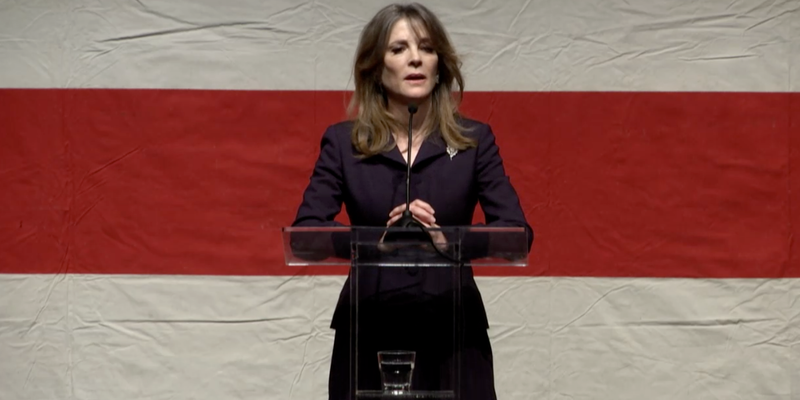 Internationally acclaimed author Marianne Williamson announced her candidacy in the 2020 US presidential election during a political rally at the Saban Theater in Los Angeles on Monday. Williamson, a native of Houston, Texas, has authored numerous bestselling faith-based and spiritual self-help books. She regularly appears on „The Oprah Winfrey Show“ and is described as Winfrey’s spiritual friend and counselor. She founded Project Angel Food, a program that has served 11.5 million meals to HIV/AIDS-affected people in Los Angeles. Williamson is the fifth woman with eye toward 2020. Democratic Sens. Kamala Harris of California and Kirsten Gillibrand of New York; and Rep. Tulsi Gabbard of Hawaii declared their candidacies in January. Democratic Sen. Elizabeth Warren of Massachusetts launched an exploratory committee in late December. As Williamson made her 2020 debut in Los Angeles, Sen. Harris, a Democratic frontrunner in the election, headlined a CNN-sponsored town-hall event in Iowa. All in all, the Democratic playing field for the 2020 election is already composed of ten potential candidates, which includes former Secretary of Housing and Urban Development Julián Castro and Indiana South Bend mayor Pete Buttigieg. In her announcement speech, Williamson homed in on Donald Trump’s rollercoaster presidency and suggested the emergence of nationalism was the result of economic despair.